Good advice on the trailer. Last year, we found that Blew Daze had a need for two new tires. The trailer had been upgraded with the addition of a second axle, but the tires that were on the new axle were old and used. (Pamela's ex-husband got frugle) Both tires were in poor shape with little tread and questionable sidewalls. As an extra bonus, the "spare" was flat. Took the rig down to the local Goodyear tire store and had them check the bearings as they installed two new tires, and converted the best of the worst to a spare. Seems that we had a bad bearing on one side of the original axle. When trailering across country during our move east, the Ryder car trailer experienced two flat tires (good thing we had 4 to choose from) and we had to wait for road service. Moral of the story is you cannot be too careful of the maintenance of tires, brakes, axles and bearings. Don't forget the hitch too. My first Rhodes was a used one. The trailer seemed fine, but I was going to trailer to Michigan from Cincy, so I decided to check the axles. There were bearing buddies on the axles and I would venture to say that the wheels had not been off in 5 years. The previous owner just kept pumping grease into the bearing buddies. Net result was that I had the slickest brake shoes and drum around. It took forever to clean up that mess. I have some experience in boat transport. I shipped the Rhodes 22, the Newport 17 and my 95 Jeep GC from Durango, Colorado to Edenton, NC where Elton accepted delivery for me. The cost for this 2,250 mile trip on one flatbed truck was $3,800. I had all kinds of numbers thrown at me, and this was the best deal. You can search the internet http://www.truckaboat.com/tspdirect.html and http://www.movecars.com can give you some guidance. I found that there was one group that took your name and boat type, then lined you up with various haulers, so you could get a rate that did not include a "to and from" charge. 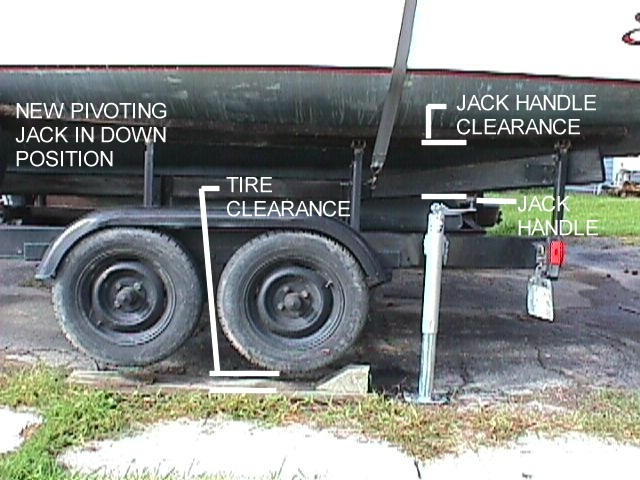 I would look at the car haulers first, since most boat haulers require a crane to remove the boat from their cradle type trailers. The car haulers have flatbeds that accomodate the boat trailer. If you were to tow it just once, you might do well to contract out the delivery. But if you are going to move it to your home, then to the sailing area, you have two moves that will add up. If the boat will remain at your sailing port all season, then I would go with a Ryder truck or rental truck to move the boat. Come to think of it, the Ryder trucks have governors that cut out at 69MPH, and are underpowered. Then again, where would you get up to 70MPH on the East coast anyway? You want to see my trailer, you got it! Here are 3 links to pictures of my boat sitting on its trailer. My trailer is a 1976 Lil Dude tandem axle boat trailer. This was before the days of the factory Unimatic trailer. In the pictures, you can clearly see the funnelling guides, the keel guides, & the bunks. In these pictures, the keel roller assemblies are not visible. The keel rollers are mounted onto the trailer cross members underneath & in-between the keel guides. In picture #2 of the above 3 pictures, the aft keel roller would line up with the bunk support strut near the back of the rear tire. 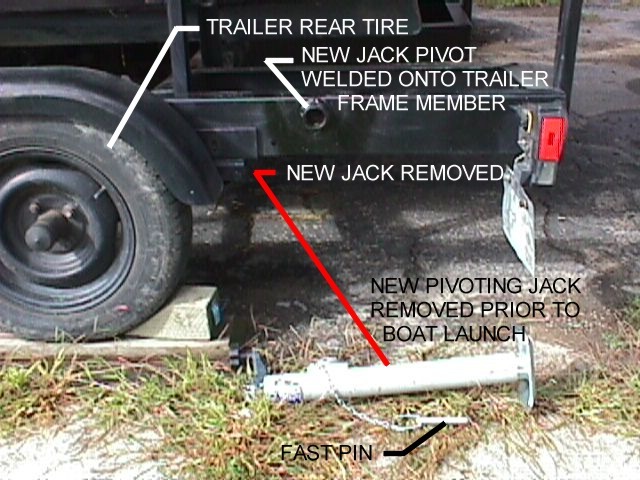 The forward keel roller would line up with the bunk support strut near the center of the front tire. If you look on P694 of the 2001 WEST Marine Master Catalog, my keel roller & bracket assemblies are equivalent to the Shipshape model #1229772, 12" wide roller with a center groove & bracket. There is a nice color picture of the keel roller assembly & adjustable bracket in the lower left corner of the page. 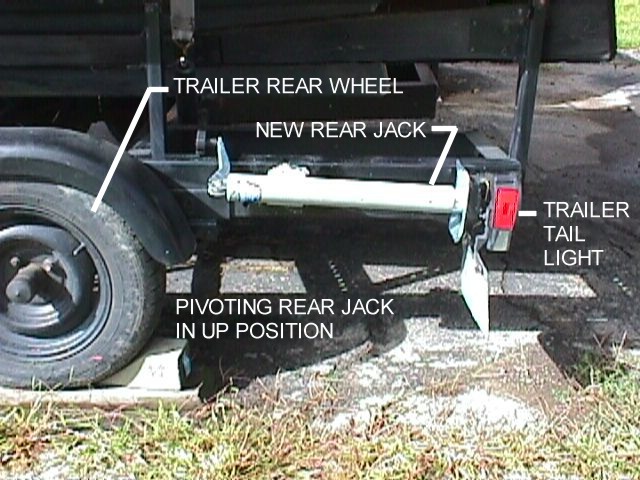 Note that the bracket has slots for four 5/8-11UNC carriage bolts to mount it to the trailer frame cross members. My trailer frame cross members have predrilled holes for mounting brackets like this, but these holes wouldn't be hard to drill if your trailer doesn't have them. My centerboard also protrudes slightly from the shoal draft keel. It does not hurt the centerboard to put load on it while on the trailer. But, with the center groove in the keel rollers, most of the weight is taken by the shoal draft keel. The boat is the strongest at the keel & this is where you want to support most of the weight of the boat when it's on the trailer. The bunks should function more like "outriggers" to stop the boat from tipping over. You need at least two keel rollers in order to make this system work properly. I've been trailering the boat like this since 1987 & I don't know how long before that the previous owner used this setup. It's been absolutely bulletproof for 14+ years & thousands of miles.